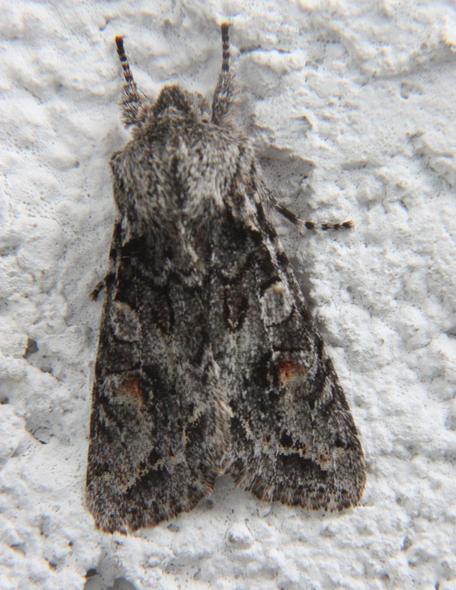 Jeremy Tatum writes: Here is an Egira hiemalis from the wall of my apartment building in Saanich this morning. On January 12 we posted a photograph, by Sher Falls, of a Thick-headed fly Physocephala burgessi, perched on an Ox-eye Daisy, and we speculated on whether the fly was aware of the crab spider lurking underneath the flower. This reminded Jeremy Gatten of a very similar photograph that he took a few years ago on Mount Washington, of the same species of fly on the same species of flower, also with a crab spider there. But this time the fly, evidently initially unaware of the spider, is by now all too very much aware of it!